Iv just bought and sc38 turbo from scooby clinic plus a 3 port boost solenoid. So we will see what happens mate. Im just wondering if the sti injectors will be enough or if i need to replace them aswell. Thanks mate! Yours is a cracker too👍 aye everyone says something about the reg. It suits it! Haha. Aye that would be good mate, will need to get something organised. Hi mate im from Paisley. First post on the owners club! 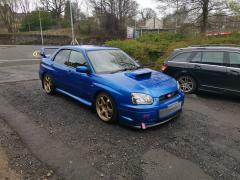 Always good to meet other scooby members lol got a bugeye wrx wagon and blobeye sti👍 gimmie a shout if your ever up Glasgow way mate.